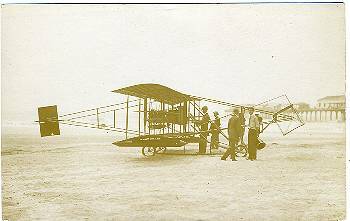 JACK192-Beautiful close-up of Curtiss Plane. 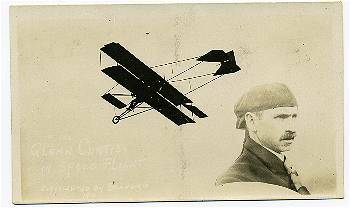 JACK193-A great close-up of Curtiss. CANCEL: not until Dec.23, 1959 from Cleveland and stamp on back states, "Duplicates of these cards can be had at A.R Rheinegger, Sandusky, Ohio" $.03 stamp on back. JACK194-As above but not used. JACK195-Curtiss at Cedar Point, Ohio. 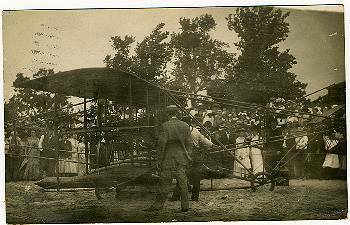 CANCEL: Sandusky, OHIO, Sept. 15, 1910. 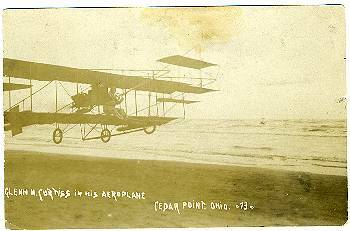 Stamp printed on back :E. Niebergall, Commercial Photography, 408 Camp St., Sandusky, Ohio. 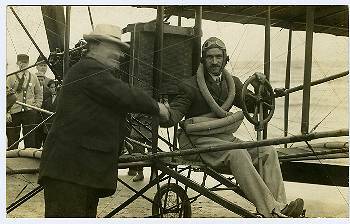 JACK196-Glenn Curtiss Landing at Sandusky after establishing new world record for flight over water, Cleveland to Sandusky. JACK197-Photo of plane at Cedar Point. CANCEL: Cedar Point, Sept 2. 1910. Cancel readable but incomplete. 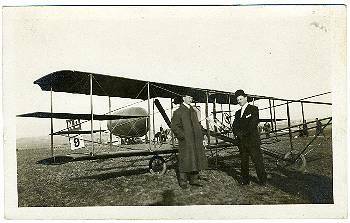 JACK198-Curtiss biplane published by Moshring & Groesbeck, Lynn, Mass. Stamp on back by Benner. 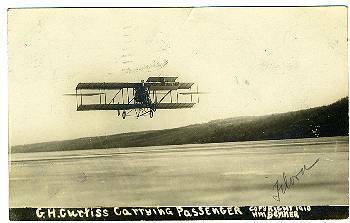 CANCEL: Hammondsport, N.Y., Sept.28, year date obscured by stamp. Copyrighted by The Bailey Co. Photo Dept, Cleveland. JACK201-The Million Dollar Pier in Atlantic City. 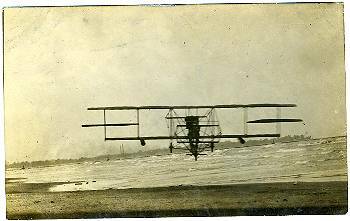 Curtiss overhead. Copyright by McKeague Co,, Atlantic City. Signed on front and stamped on back. 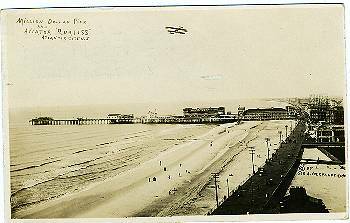 CANCEL: Atlantic City, Aug. 25, 1910. Very Clear. 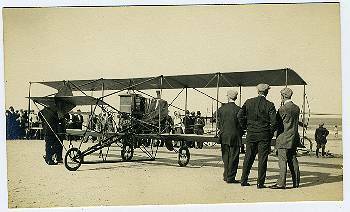 JACK203-Aviation Meet, Atlantic City, 1910. Printed at top left: "Hubin's Big Post Card Store." 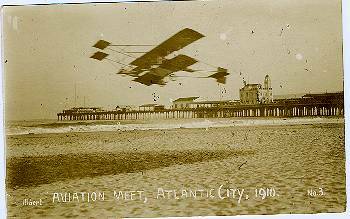 CANCEL: Atlantic City, Jul 25, 1910 and cancel for received at Wenonah, N.J.
JACK204-Glenn Curtiss, Speed Flight. Copyrighted by Benham Co. 1910. Writing on front very faint. 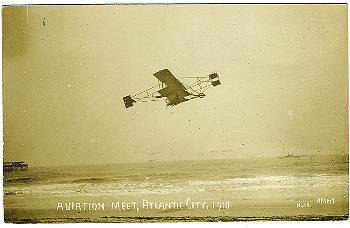 JACK205-Another real photo of Aviation Meet at Atlantic City. Copyrighted by Earl Studio on the Boardwalk, #3. JACK206-Albert Studio, Arkansas Ave. & Beach, Atlantic City, NJ. Also stamped by Hubin's Big Post Card Store, Atlantic City. 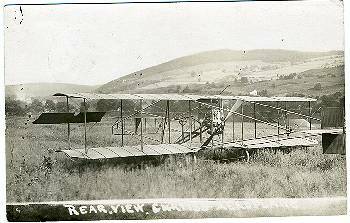 JACK207-Bottom states, "Rear View Curtiss Airplane." CANCEL: Savannah, N.Y., May 1912. Registered but light. 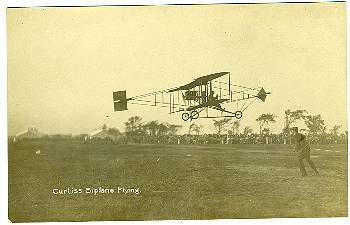 JACK208-"Curtiss at Los Angeles" on back of card, handwritten. The #9 on the plane means it was part of an exhibit. 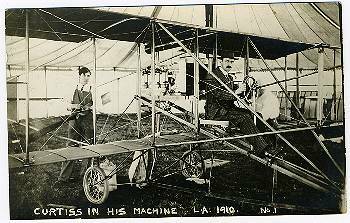 JACK209-A close-up photo of Curtiss in his plane a L.A. in 1910. 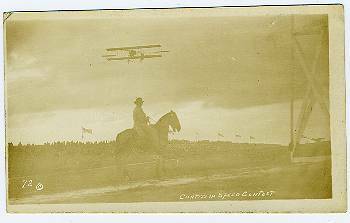 JACK210-This faded yet viewable photo shows a cowboy below Curtiss flying in "speed contest." 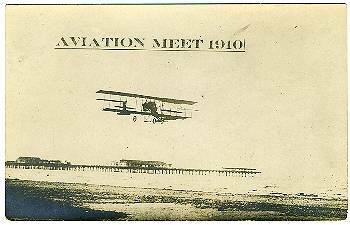 On back: Photo copyrighted by Benham Co., Los Angeles, 1910. 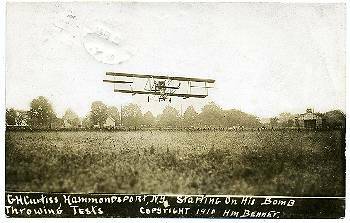 JACK211-Curtiss at Hammondsport, NY, starting on his bomb throwing tests. 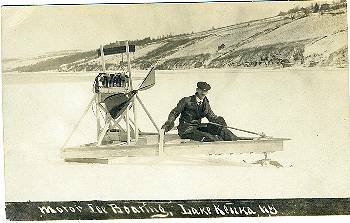 Copyright 1910 by HM Benner. CANCEL: Hammondsport, NY, Oct 4. Stamp half-off but no damage to postcard or circular cancel. 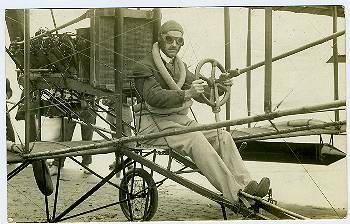 JACK212-Curtiss airplane with passenger. Copyrighted by Benner, 1910.